When traveling to Morocco you’ll find the magical world of Riads. 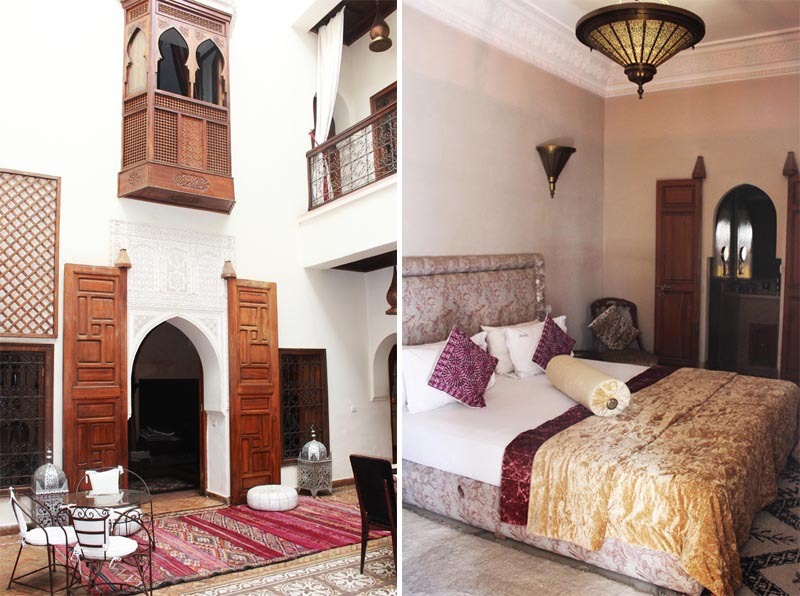 A Riad is a traditional Moroccan architectural style building, that is located within an ancient medina (walled city), with a courtyard or garden in the center. When I started my research for places to partner with for my Around The World Beauty Journeys it was essential to find a women-owned business that focused on making an environmental impact, and that loved beauty as much as I did. I then discovered Emma founder of Camp Adounia and Riad ZamZam who is a true #GirlBoss. She focuses on operating in a way that respects local communities for an authentic philanthropic travel experience. I told her about my obsession with beauty ingredients so she set up a meeting with me and her Spa Facialist to learn a little more about Moroccan Beauty, and what to expect during my time in the Hamman. We pass by these incredible places but often don’t really understand the ritual process or what exactly is used. I wanted to get the real 411 and begin my #BeautyExploring Journey in Morocco with Riad Zamzam Spa. Beldi Soap – prepares the skin for exfoliation. Raw Rhassoul Clay – Rhassoul clay is rich in minerals and helps detoxify and gently exfoliate the skin. It’s best to be completely naked. You might want to wear small underwear but be ready to strip down. It’s going to get hot! But if at any time you feel sick just stand up and pour some water on yourself. You will never want to take a regular shower again. You’ll want to buy all the products to recreate this at home. In Morocco, all wellness rituals begin at the Hammam. Women and men from all economic backgrounds take part in bathhouse practices as a way to life. The first part is dedicated to the deep scrubbing and exfoliating of the skin with the beldi soap. The steam is then used to open the pores, and clean them while kessa which is known as the scrubbing glove works it way from top to bottom removing all unwanted residue from the body. But no matter how clean you think you are, your not safe from the kessa. You wait in the steam room to detoxify and soak in all the nutrients from the beldi soap for some time. After 10 minutes your attendee returns and washes you down with water. Another rub down follows but this time with Rhassoul Clay. They even apply some to your hair. Allow another few minutes and then a wash down but this time its a relaxing shower. At Riad ZamZam you can have a massage and facial after your hamman or enjoy the rooftop while drinking tea and soaking in the sun and the sounds of the Medina. Set-up a cab to go into the market: Riad ZamZam will set up a cab to pick you up at the doorsteps and drop you off at your desired time. For about 5 euros each way you can enjoy the Medina relaxed knowing you have a private cab waiting for you to take you back when your ready. I suggest taking time to explore the Medina.Some of my favorite shops in the Medina are Al Kawtar Cooperative, Henna Cafe, and Handmade cosmetics by Naturom. Also beauty is very much like food. It takes great quality products and a good cook to create a masterpiece. While learning all about beauty we made time to fit in a private Cooking Class with the team at Riad Zamzam. We created a classic Tagine dish with 4-5 salads. Of course, I was the lucky one to eat it for dinner and even had some for lunch the next day. 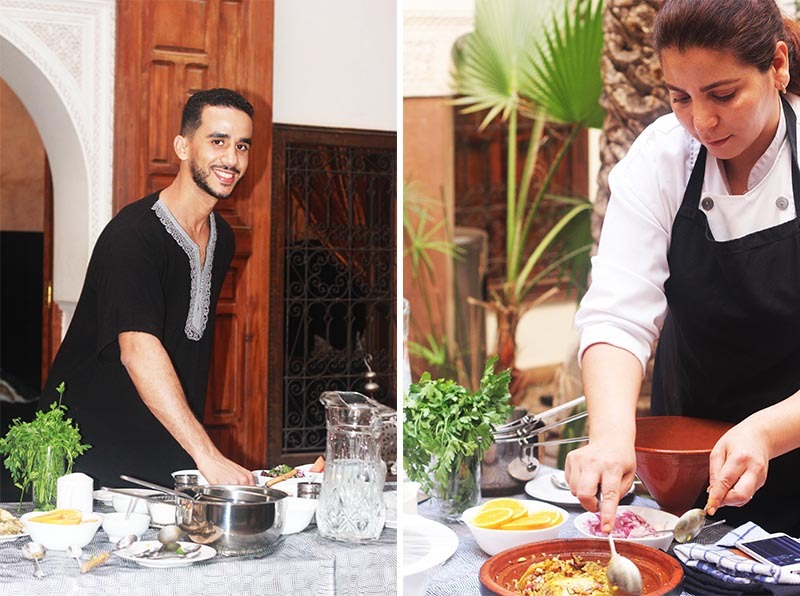 I would definitely stick around for a cooking class if your time permits, and enjoy the cuisine of this Riad. Its a memory you will never forget.